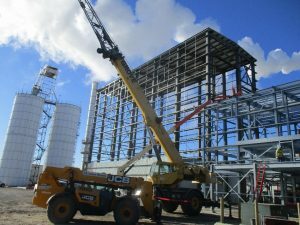 The Iowa Ethanol Producer needed to repurpose existing buildings and structures, as well as add two new buildings, to be able to install a new DDG decanting, drying, and loading system. This project started in the conceptual phase and went through all phases including start-up and commissioning. Engineering and design was done on a fast-track schedule and took five months to complete. Started structural design while equipment and vendor selections were still being finalized. A strategic design approach was taken in order to continuously adapt to evolving information while also limiting rework. Incorporated existing 4-foot thick reinforced concrete mats into the foundation design of the new structures to reduce demolition and construction costs. Repurposed an existing truck unload structure by designing an economical method of filling a 16-foot-deep pit with lean concrete. An elevated second floor concrete slab and drain system for containment. Design considerations for future decanter additions. Removable wall panels and a 5-ton monorail system for servicing or adding equipment. Designed another approximately 2,900 square feet building extension to house new drying equipment. Repurposed an existing 4,600 square foot building by adding a new set of stairs to increase egress and by framing a new level for supporting a 20 psf utility load. Designed a 30-foot extension of an existing MCC structure. Repurposed steel and existing foundations from an existing 140-foot long conveyor bridge to carry the new conveyor at a new elevation to facilitate the new process. Designed several new access platforms for new equipment drives and motors. Designed several new pipe supports for new process lines. Ran Finite Element Analysis (FEA) of all the new and existing structures to evaluate their capacities against the new equipment weights and all applicable loading per the latest building code. Issued 34 structural CAD drawings.